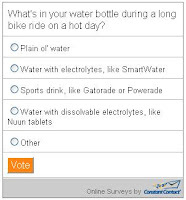 Century Cycles Blog: Poll: What's in your water bottle? 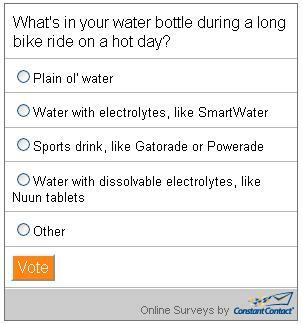 What's in your water bottle during a long bike ride on a hot day? Click here to take our latest online poll and let us know! Last month's poll asked, "What's the most valuable lesson you've learned from your cycling friends?" The top answer, at 31% of all votes, was "Not to buy a bike at Walmart." Second-place was "Wearing a helmet" (21%), but that was followed very closely by both "Not wearing underwear under my bike shorts" (19%) and "How to change a flat tire" (18%). Surprisingly (or maybe not? ), the "snot rocket" was the least popular response, at 12%.